Gift card and ribbon options can be added at checkout. To order 10 units and above please login and use Bulk order. Hip Hampers® is a trademark of Hip Hampers Pty Ltd; registered in Australia. © Hip Hampers 2018. All rights reserved. You have no or insufficient stock available in your account. Place an order now or if you have recently placed an order, please wait to receive notification that the stock is available in your account. Alternatively you may continue with this order by selecting the unbranded option. You have insufficient stock available in your account. Place an order now or if you have recently placed an order, please wait to receive notification that the stock is available in your account. Alternatively you may continue with this order by selecting the unbranded option. 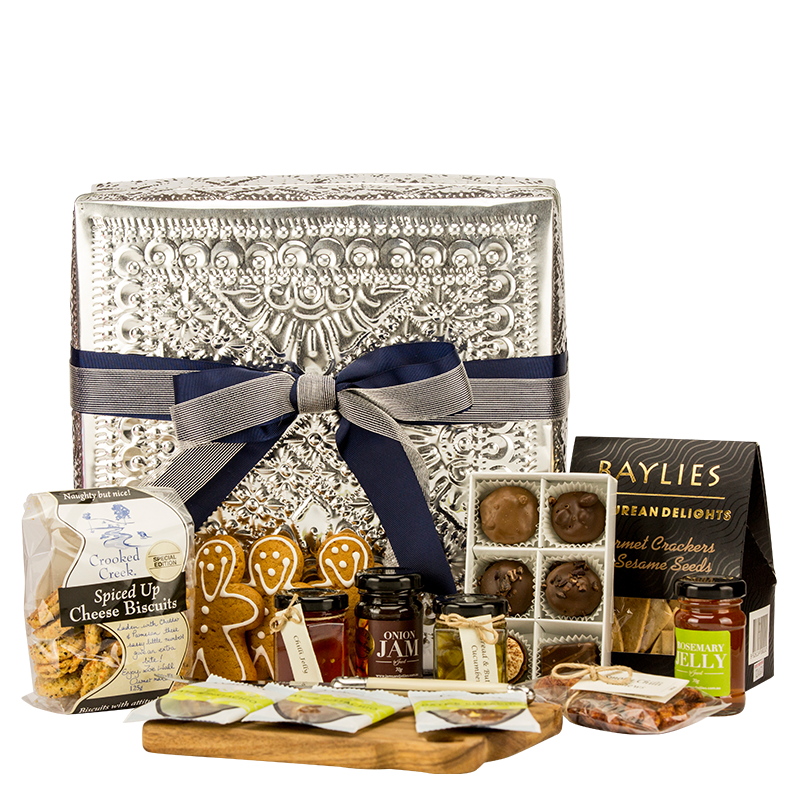 Hip Hampers fully design your cello glazed branded hamper wraps. Once these are designed Hip Hampers will hold these in stock for your company. The wraps can then be used across our full range of Corporate Hampers to fully promote your brand when gifting. If Hip Hampers have already designed your wrap and you have not logged in, please login to your account to be able to place an order. To find out more information and to order Branded Hamper Wraps visit our Corporate Gifting Page. Contact us on 1800 008 100. Hip Hampers fully design your branded candles. The candles can then be used within any candle hamper within our Corporate Hamper range to fully promote your brand when gifting. If Hip Hampers have already designed your candle and you have not logged in, please login to your account to be able to place an order. To find out more information and to order Branded Candles visit our Corporate Gifting Page. Contact us on 1800 008 100. Hip Hampers fully design your Branded Big Chop Cheeseboards. The Branded Big Chop Cheeseboards can then be used to replace any unbranded Big Chop Cheeseboards within our Corporate Hamper range to fully promote your brand when gifting. If Hip Hampers have already designed your Branded Big Chop Cheeseboards and you have not logged in, please login to your account to be able to place an order. To find out more information and to order Branded Big Chop Cheeseboards visit our Corporate Gifting Page. Contact us on 1800 008 100. Hip Hampers fully design your Branded Provincial Cheeseboards. The Branded Provincial Cheeseboards can then be used to replace any unbranded Provincial Cheeseboards within our Luxury and Corporate Hamper ranges to fully promote your brand when gifting. If Hip Hampers have already designed your Branded Provincial Cheeseboard and you have not logged in, please login to your account to be able to place an order. To find out more information and to order Branded Provincial Cheeseboards visit our Corporate Gifting Page. Contact us on 1800 008 100. You must login to use the previous details.